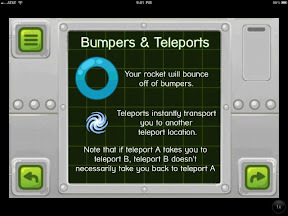 I friend of mine (Michael Fogleman) released just few days ago his first game in the apple iPhone store. I had the luck to test the game during development and i have to say the final product got much better than the test version which was already pretty good. The game is called star rocket and costs $0.99. There is no advertisement which easy justifies the Dollar to pay. The idea of the game is pretty simple. 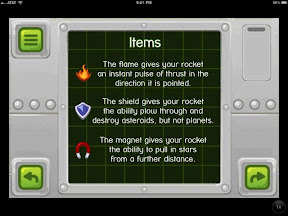 You are navigating your rocket through space by trying to collect the stars. The developer did a very nice job in advancing the levels. It gets pretty interesting around level 28. Like angry birds, the levels are advancing the further the game goes. There are astroids, planets, teleports and shields etc. Each of them have other little functions. 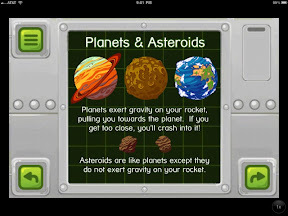 The rocket is not allowed to hit an astroids or planet and the bigger they are the stronger is the gravitation. A teleport jumps you to another place in space. And the shield keeps your rocket save against astroids but not planets. Even if the game is so simple to understand it comes with a good tutorial. The idea is to finish the levels as fast as possible to advance to the next level. You have basically unlimited lives, you can try as often you want a level even if you managed a level you can play it again. 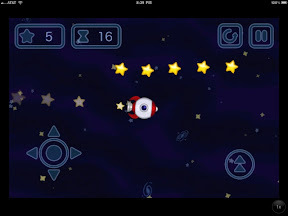 The faster you manage a level the more stars you get (up to 3). I believe the app has right now 85 levels. But I am not able to pass 39. Once you start the game to play you don't want to finish. It is like a drug. I basically replaced my angry birds with star rocket. The only few things i am missing is an iPad version and the ability to see an overall high score. However you will see for each level current time and your best time. The game has a lot of helpful details. 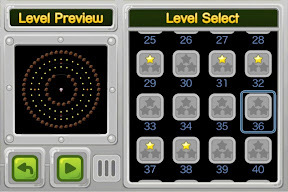 For each level you see a preview and during playing you see how many stars are left and a green arrow indicates where the nearest star is. They thought about everything. The user can even switch the controls around if the user is left handed like me. i am just wondering what ghost on means. The designer did a really nice job, especially the planets have a lot of details. Sound effects are nice too. Overall I will give this game 5 stars and i am pretty sure we will see a lot of cool new features coming up and maybe an iPad an Apple app version. So you think Apple computers are expensive? iPhone coming soon as a different form factor? LunaTik and iPod nano just not a good fit. Cheaper iPhone on the way? Linkedin is going public - is the time right?